Kalbfell, Mitchell Rice, Brad Kemmler and Steven Sillifant. 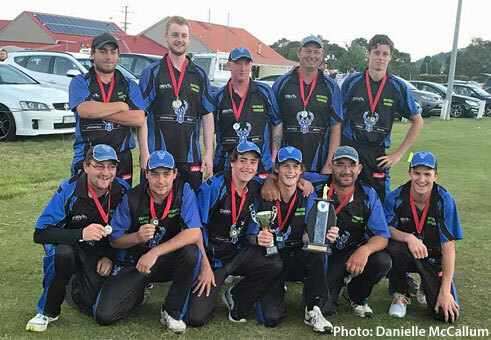 AFTER winning last season's Seventh Grade T20 Super Bash Grand Final, New Norfolk III has made it back to back by defeating Knights by six wickets on Tuesday night. The Red Caps had all the answers during the match, restricting the home team to just 7/87 off their 20 overs on the small Collinsvale ground. Then following up their good work, they chased down the total off just 15.2 overs to finish 4/89. Brad Kemmler was named man of the match for his tight bowling of 1-10 off four overs and hitting the winning runs with a massive six and a nice four to remain 14 not out. Undefeated captain thus far this season, Nathan Heron 27 (four fours) and fellow opener Shayne Upton 21 (two fours, one six) got the team off to a great start with a 33-run partnership. Steven Sillifant also had a great game taking 2-19 (4) and then making 12 with the bat (two fours). Others to take wickets were Liam Kalbfell 2-21 (4) and Mitchell Rice 1-17 (3). Well done to young Jake Stevenson who is in his first year of senior cricket after playing in the Under 14s last season. He has now played in all four T20 matches including the premiership win. Of the players from the premiership win, David Mitchelmore, Shayne Upton and Stuart Muir all played in last season's winning team. Congratulations Red Caps. 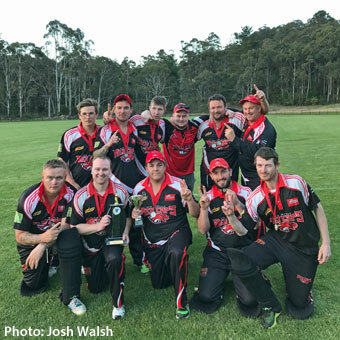 Also this week, the Bothwell Cricket Club secured its first premiership win since joining the Southern Cricket Association three seasons ago. Playing in the Fourth Grade T20 Super Bash Grand Final, the Bucks defeated last season's premiers Bagdad in a very close affair by 10 runs at Bagdad. Winning the toss and batting first, Bothwell posted the good score of 7/152 off its allotted 20 overs. Opener and man-of-the-match Tyler White set the scene with an great display of batting, compiling a fine 61. Fellow opener Matthew Eyles gave great support with 18. Further down the order, brothers Nathan and Josh Eyles made sure the scoreboard kept ticking over, making 30 and 18 respectively. In reply, Bagdad put in a gallant effort but was held up by some good bowling by the Bucks attack, in particular Josh Eyles who sent down 3.4 overs to finish with the fine figures of 4-11. Eyles capped off the evening in style, taking the final wicket and leaving Bagdad just 10 runs short at 10/142 off 19.4 overs. Brock Nichols has led his team wonderfully in the T20 series, and did his bit taking 2-19 (3) while Matthew Eyles and Brodie White took a wicket each. Congratulations on a job well done Bothwell and I hear you all enjoyed the win back at the Castle Hotel.